Recently my sweet little family of four went on our first little family vacation. It's hard to describe, but this was the first time that I felt like, whoa, I am the mom and this is my little family out on vacation and I have to plan and keep everyone safe and happy! We did some touristy sightseeing, stayed in a hotel, the whole bit, and it was a BLAST! :) Our time being here in Iowa is coming to a close pretty soon so we're trying to go out and explore all the different cities within a few hours that we can, and there are a lot! Within five hours we can go to: Minneapolis, Chicago, St. Louis, Milwaukee, and Kansas City, just to name a few. We are going to try and see as many of these as we can and first on the docket was St. Louis, Missouri. Now, of course when traveling to any new city, to get the full experience we had to try the food they are famous for. St. Louis has got some pretty interesting ones. In this article I would like to talk about the one and only St. Louis Gooey Butter Cake. Sounds pretty great right? Who doesn't love a gooey, buttery cake? :) This cake consists of a dry, flat base covered with a "goo" mixture. It is sticky and chewy and very delicious. Basically all it is is a pretty simple little cake with your usual cake ingredients: flour, egg, sugar, yeast, butter, salt, and milk and you mix that up and let it rise then add a topping with basically the same ingredients again including more butter (because why not? :) ) and the addition of vanilla and light corn syrup and you let it bake and sprinkle it with powdered sugar on the top after it is out of the oven. It turns out to be this lovely, flaky cake that is, of course, gooey in the center. It is generally served as a type of coffee cake and not as a dessert cake. I don't really think there is any way I can describe to you how delicious it is because it sounds like such a simple cake, but it really is so yummy and unique and worth making at home for a new experience. This ultra-sweet treat is a St. Louis tradition and available in local bakeries all around the city of St. Louis. It is said to have originated by accident in the 1930s, when a baker mixed up the proportion of butter in one of his coffee cakes. Rather than throw it out, he sold it by the square, and the sugary, sticky confection was a big hit. Apparently, the gooey butter cake has taken a front row seat in place of, or next to, pumpkin pie at Thanksgiving for many Missourian's. The original cakes are made with a yeast-raised sweet dough on the bottom, but now days most recipes use a cake on the bottom. There is a much easier version of this cake which uses a yellow box cake mix and just a few other ingredients, but I wanted to give you the made-from-scratch version that I feel is closer to the gooey butter cake I actually had in a St. Louis bakery. 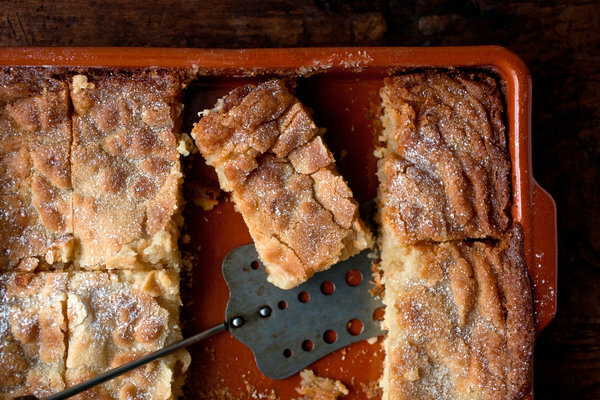 I hope you get your taste of St. Louis by trying this delicious gooey butter cake. 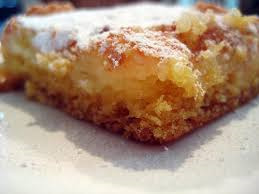 Please let me know in the comments below if you have ever had gooey butter cake, I would love to know! Spoon topping in large dollops over risen cake and use a spatula to gently spread it in an even layer. Bake for 35 to 45 minutes; cake will rise and fall in waves and have a golden brown top, but will still be liquid in center when done. Allow to cool in pan before sprinkling with confectioners' sugar for serving.